Aston Martin's Cygnet has a stylish design and innovative features that make it "advanced, iconic and iconoclastic," CEO Ulrich Bez says. BERLIN -- Aston Martin was profitable through the economic crisis and its new Cygnet minicar will be a cult hit like the brand's models made famous by James Bond movies, CEO Ulrich Bez said. After two decades of ownership, Ford Motor Co. sold the British luxury sports car brand for $674 million in 2007 to a group of investors led by Kuwait's Investment Dar. Bez said not many people thought Aston Martin would survive alone but the company was profitable through the crisis and will be profitable in 2010 and the coming years. "My investors are happy," Bez said at the Automobilwoche industry conference here. Automobilwoche is an sister publication to Automotive News Europe. The CEO, who has led Aston since 2000, said the company will not look for an industrial partner, despite the industry trend for automakers to seek alliances to cut costs. Since Ford cut the brand loose, Aston has been successful as an independent company, funding its products alone, and will remain so, Bez said. Aston Martin's forthcoming Cygnet has surprised brand purists because the tiny 2+1 minicar -- just a little larger than a Smart ForTwo -- is a major departure from the company's usual big high-performance sports cars. Bez said he believes the Cygnet has the appeal to make it a cult icon, just like the DB5 that James Bond drove in hit movies. "The Cygnet is exclusive and bears an exclusive brand name," he said, adding that the car's stylish design and innovative features make it "advanced, iconic and iconoclastic." Aston Martin will sell about 3,000 Cygnets a year, priced from 30,000 euros, Bez said. The car is a reworked, upscale version of the Toyota iQ and will be assembled at Aston Martin"s Gaydon factory in England starting in early 2011. 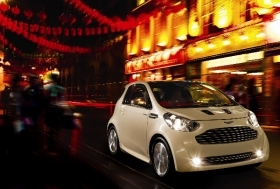 Bez said the Cygnet will help Aston Martin reduce its fleet CO2 emissions in line with demands from legislators in Europe and the United States.